Exporting and inward investment are vital to the growth and prosperity of British businesses and the UK financial market alike. No matter what size your business or what sector you’re in, you can hardly have missed the continued focus on international trade and its impact on the growing economy. The message is clear: Exporting is the new vogue for forward-thinking UK businesses. Yet export growth has been uneven, says Boyle. “Risk aversion – particularly for smaller businesses – means some are slower to capitalise on high-growth markets abroad than others. SMEs may not have the capacity to chase payment.” UK Trade & Investment calls this mindset one of British firms’ “barriers to export success” – and identifies “appropriate financing arrangements” as one of the most powerful means to overcome it. Whether you’re looking at making current export activity more profitable, or starting to think about export, you’re not alone. 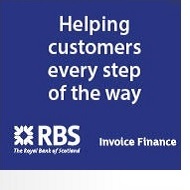 RBS Invoice Finance is proud to partner and support you, every step of the way.